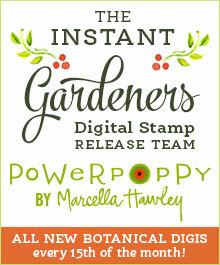 GOOD MORNING POWER POPPY FANS! I’m back today with a new digital release from Power Poppy called Vital Rose. Now here’s an image that will brighten up a cold, dreary day! This digital stamp set features a large single rose that opens up to welcome all that life has to offer. With lots of room to shade the petals, you can be as loose or as detailed as you’d like in your coloring, and still come away with a dramatic final piece. Available solo or with poetic words handlettered and winding around the petals. Includes no-line versions, too! I didn’t have a lot of time yesterday to put my design team card together so I decided to keep the coloring and the card design super simple. Since I only had petals and leaves to color, I selected my favorite RV & YG combinations to keep marker selection quick and easy. After coloring the image, I used the largest die from the Cross Stitched Rectangle Stackables from Lawn Fawn to trim the image layer and added a few dew drop embellishments from Honey Bee Stamps. So here’s the finished project! Love this card Nancy! For a quick and simple card it is amazing! No pun intended, but that really POPS! I love it. Awesome card Nancy, the rose is beautiful aswell as the sentiment/quote. I love the Cross Stitched Rectangle die you used. Thank you so much for sharing. Great job, also loved the rose sympathy card!